The city directories for the years 1933-1934 were the last ones published for the various boroughs of New York City. Subsequently, telephone directories were published, listing perhaps less information than was available in the earlier years. 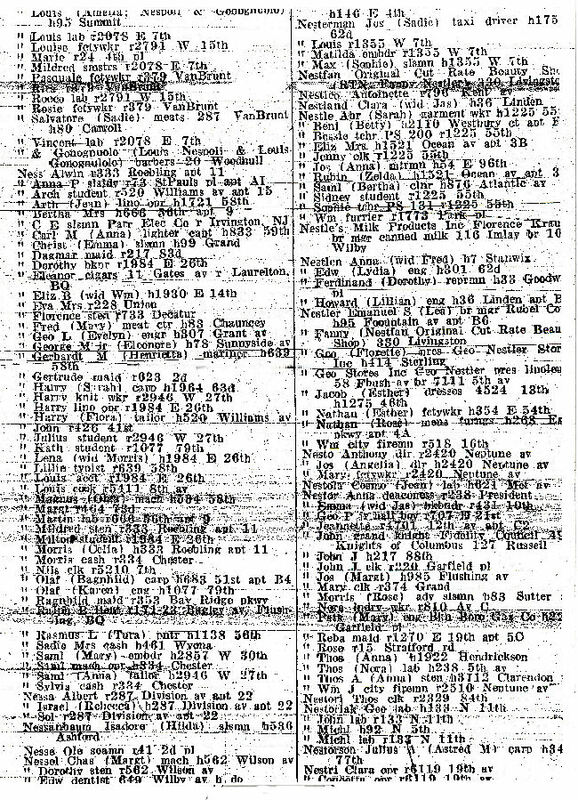 These microfilmed directories, accessible at various New York City libraries, archives et al, can be a very valuable tool for the person seeking to trace the movements of family members from the middle to late 1800s until the years 1933-1934. The name of the resident or head of household is listed, surname first, the spouse's given name (in parentheses), when applicable his or her occupation is given, then their home address (when a head of household is listed, the letter "h" precedes the address; the address of others, e.g. minors, is preceded by an "r.") Sometimes a place of employment is listed. One shouldn't forget the possibility that a person's place of business (or the person themselves, if self-employed) may have placed a display advertisement in these directories, so this might be something valuable to look for. When a woman was widowed, the word "wid" appears next to the name, often with the name of her deceased husband. If you look in earlier city directories and find that this woman is married, you can then estimate the year her husband passed away. Similarly, a person in one year's directory listed individually may the next year be listed with a spouse. This can allow you to estimate the year this person was married. Often we try to find information about our family/ancestors by accessing census records. When this search is limited or unsuccessful because we do not know the family address, city and telephone directories can be very useful, as a careful search may reveal the information needed. Even apartment numbers are listed in the old city directories. Also, by searching for a particular surname, you may discover others with that same surname that you were previously unaware of. CITY-DIRECTORIES-L@rootsweb.com . Ask for the help you need. Put the name of the city in capital letters at the beginning of the subject line, and then outline the rest of the subject, e.g. "NEW YORK CITY - GOLDBERG - 1920 lookup request." Make your subject heading clear and concise if you want to get more responses. List the city, year(s), and surname you want information on. Many people who might respond to your posting won't open messages that don't state the names of the people you are looking for. This site is run totally by volunteers.